*** please RESTEEM and VOTEUP if you like this post. *** REMEMBER I AM TELLING YOU ALL OF THIS IN ADVANCE. In today's analysis, I'm going to give you a COMPLETE PICTURE of Bitcoin as I see it, in the coming months ahead. Most traders, if not all traders, are far too focussed on looking at their 60minute, 5minute, 3minute and even 1 minute charts! The expression "can't see the woods from the trees" comes to mind, meaning to have an unbiased objective view you need to take an aerial view and see the bigger picture. In this article, I wil teach you the value of saying to yourself STOP ! And to constantly ask yourself "What is the bigger picture?" The best traders always know where we are in the bigger picture, that's how we make big money. 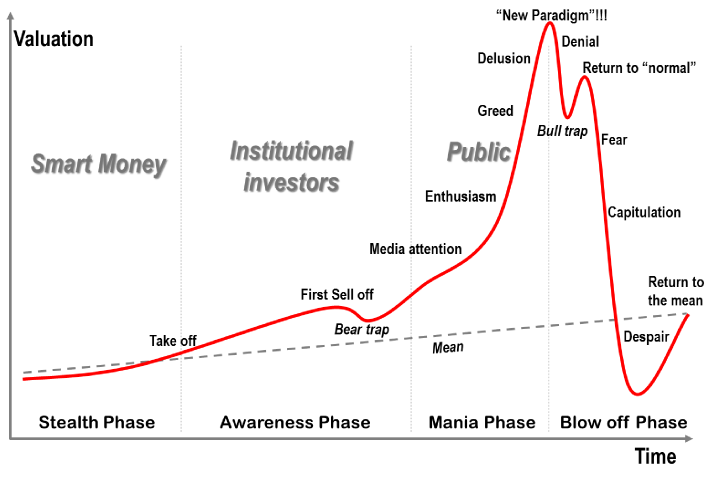 Professor Rodrigues talks of 4 distinct stages of a Bubble - Stealth Phase, Awareness Phase, Mania Phase and Blow Off Phase. The "Return to "normal"" phase, is known in Technical Charting terms as a "Dead Cat Bounce" (sorry not my term, I'm an animal lover). I have stated, prior to this happening, how I will trade this with specific, entries, stop loss and targets. So you can see I am prepared, in control and looking to make $$$. You can too if you plan your trade with risk management. Now be aware, markets don't just go straight down and there wil be violent swings both up and down on a daily, hourly and lower time frame charts. We are in for volatile times ahead - this is the calm before the storm. So get ready I am forewarning you. Money can be made in short term trades and long term trades. You just have to plan and have excellent risk and money management. For speculators, there are exciting times ahead to profit from. In this article today, my analysis presents you a BIG PICTURE and as long as you stay focussed you are now empowered to make good money. You are receiving from me 10+ years of successfully trading experience in muliptle financial markets, which I am freely sharing with you. All I ask in return is you simply press the button to Resteem this post and subscribe to my YouTube and Facebook Channels. That's it. If you like this post feel free to "Resteem"this post , "Voteup" and follow me at "https://steemit.com/@supertrader"
Another great episode thank you Sean! What I was asking myself during this series is that you always mention that you profit with the price drop of BTC. Is this profit caused by the knowledge so that you sell before the fall or how do you manage to earn money with the lower targets? Yes i notice that very few people know how to SHORT Bitcoin. I think I wil need to teach this. Everyone shouldstart learning how to short Bitcoin now. The most money is to be made shorting - it falls faster and harder. This post received a 4.4% upvote from @randowhale thanks to @napkin! For more information, click here! Shorting bitcoin is asking for the bank to lend you bitcoin that you sell asap, and then, you buy it back and give it back to the bank. This is done with leverage. Do you suggest any website for shorting crypto? This post received a 4.3% upvote from @randowhale thanks to @napkin! For more information, click here! Interesting video and thoughts. You don't see too many people talking about this. More people are about buy, buy, buy. I subscribed on YouTube. I'm going back through your old videos to learn more about crypto. Thank you I appreciate your kind comments, subscribing to my channel and watching my previous videos - I value your support. I do believe it wil prove valuable to you. Great educationnal post once again, thank you Sean. Or maybe the return to normal will be after the august period ? A very level-headed analysis. The big picture is exactly what we need to see now. Upvoted as usual. Thank you very much!